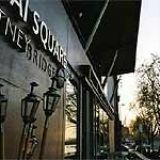 "With panoramic views over the River Thames, Thai Square Putney Bridge is situated in the award winning building of Putney Bridge with an interior designed to create a contemporary Thai theme. With awards from the Royal Institute of Architecture, the American Institute of Architecture and Wandsworth Corporation, this is one of the most uniquely styled buildings in London. The exterior of this building resembles a ship with metal beams and tall glazed windows allow diners stunning views across the river. Seats 190"
What did you think of Thai Square? Thai Square Putney is the classiest drinking place to go in Putney by far. The staff are friendly, it is layed out nicely and the drinks arent overly priced. Thai Square Putney overlooks the Thames and at night it is breathtaking. The only problem is the jealousy of the women, be prepared for that. Instead of staring, they need to head down Harvey Nicks! I would reccommend Thai Square Putney as a starting point before going to the West End. 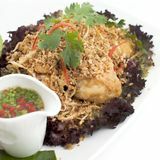 Thai Square Putney is fairly pricey but the food is good and the staff are very efficient. Don't mind Thai Square Putney for a treat every now and then. I was really surprised with Thai Square in Putney, in a good way! 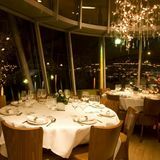 We were greeted and shown to a table quickly, as we were the only people in the restaurant it was nice to be given one of the best tables, by one of the large open windows, overlooking the Thames. It really is a huge space and I can imagine when it's busy there would be a great buzz and atmosphere. The menu is easy to navigate; I opted for the drunken noodles and my friend chose the crispy crab and mango salad. Both dishes were really, really tasty! The beef in the drunken noodles really was delicious and tender. I would definitely come back to Thai Square for a proper meal and to try more of the dishes. empty reception lots of hand praying gestures on arrival from passing staff cheapest wine 18.95 for a supermarket 6.00 bottle spring rolls so temperature hot they had to be microwaved from the fridge no other explanation noodle dish arrived with 4 pieces of noodles asked for more noodles to be added was told had to order another plate of noodles 5.50 chicken dish a huge platter with 2 pcs chicken cucumber and carrots cut to strange shapes and the plate lined with different colour lettuce all drizzled with sauce quite extraordinary i have been to thailand and never eaten anything resembling what was served the sticky rice was so hard it had to be cut with a knife a service charge of 8.5% brought the total to just over 80.00 for 2 people I explained to the waitress who was very sweet that we would not be coming back I got a beautiful smile another praying gesture after asking why they had a compulsory service charge and being told yes please see you again I realised that the charming girl had no idea what I was saying and she was unable to speak english not her fault but I do wonder what feedback management get from staff As mentioned they will never see me again and unless you are looking for a john cleese type dining experience with a little ESOL course thrown in my advice is sit outside weather permitting and get a burger from the dukes head next door! I've been to Thai Square on a number of occasions and have found it to be very hit and miss. The food is okay, not amazing. Its quite pricey (about £30 a head) but the venue is nice, the atmosphere usally good and the service friendly and I don't mind paying a bit more for a nice restaurant experience. Booked a table here on saturday for 2 for my birthday at 9pm. We asked for a window table and told them it was a special occasion. On arriving, we were told that our table was not ready and to have a drink at the bar. The bar was like a nightclub, very loud with flashing lights and being pregnant and unable to drink, I didn't want to sit there! We waited 15-20 minutes for our table and received no apology for having to wait. Our table was then right next to the toilet and we had to move it as it was so close to the next table that my husband couldn't get in his seat! We decided it was not worth paying £60 for a meal here and promptly left and sadly, I won't be going back. I should have known the meal was going to be a disappointing when the couple next to us received their bill before their desert. Our mains arrived before our starter, which we sent back. We then received only one of the starters and sat for 10 minutes until I called somebody over. 15 minutes later my starter arrived. I decided to accept it as my patience was wearing thin. When our main meals arrived, the steamed rice was dry and luke warm, indicating our meals must have been the original plates they brought us. Both were dry and tasted like a ready meal. Then the waitress kindly added my optional gratuity in for me. The breath taking setting could not be appreciated as it was overshadowed by a very poor experience. Thai Square Putney is the place to go if you’re keen to eat, drink and shake your booty. 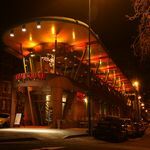 Situated on Lower Richmond Road, Thai Square Putney has a great location overlooking the Thames. 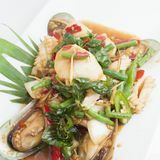 The restaurant and bar are modern, but with a traditional Thai flair. The downstairs bar is open late on Friday and Saturday nights for drinks and dancing. Considering how small the bar is, there is still a surprising amount of seating. There is a also separate little area, which makes up the dancefloor and DJ booth. This is a pleasant place to spend the afternoon or evening thanks to the good service. It can get pretty busy during peak hours, however, so it’s a good idea to make a reservation beforehand. Walking into the bar at night, you are greeted by smiling Thai hostesses and happy bartenders who run a polished operation. Despite how crowded this bar can get on Fridays and Saturdays, the bar staff still manage to serve up cocktails efficiently. The dancefloor is small, which means it's never too empty to shake your booty. The music is a little commercial and generic, but anyone can dance to it. The only downside is this popular bar can get a bit congested. Starting at around midnight, there is usually a line out the front door. If you get claustrophobic easily, leave early. If you’re going to have a full meal at Thai Square, it won’t be cheap - but it’ll definitely be tasty and satisfying. There are plenty of vegetarian dishes along with more elaborate meat options that are sure to please everyone. A decent wine, cocktail and beer selection is served up in an incredibly skilled manner. Other than the sweet lollipop farewell, you might not remember any particulars about your night at Thai Square, but the general feeling that you had a great time is sure to bring you back.